Documentation: Specimen: SUI 17469, 23 Feb 1885, Elm Creek, Buffalo Co (DuMont 1933). All color morphs have been reported in Nebraska. According to Booms et al (2008), there is “Complete gradation among plumage colors, though most birds are lumped into one of three color variants for convenience (white, gray, and dark)”. Color morphs are generally indicative of origin; wintering birds in the US are “mainly female gray morphs” (Wheeler 2003). Earlier dates are 25 Sep 1979 Thomas Co (specimen HMM 36541; Ohlander 1979), and 20 Oct 1978 Hall Co (Ohlander 1979) and later dates 13 Mar 2016 one banded in Logan Co (Danny Bystrak, Bird Banding Lab, Patuxent Wildlife Research Center), 3 Apr 2015 (Brogie and Heidt 2016, Brogie 2016), and 10 May 1993 in York Co (Morris 1993). The Logan Co bird was the first and only Gyrfalcon to be banded in Nebraska. The May report is extraordinarily late for this species; perhaps it was a lost falconry bird. Most Gyrfalcons wintering as far south as Nebraska are immatures (Booms et al 2008). Falconers indicated that they were reported “every year since 1979 in the Sandhills between Norfolk and Gordon” through winter 1984-1985 (Rosche 1994, Williams 1985); good locations are Highway 20 in the northern Sandhills and open grasslands in Sioux, Box Butte, and Dawes Cos (Steve Duecker, personal communication). Available reports may not reflect the true frequency of occurrence, as most observers avoid open plains habitats in the winter months. Most sightings are in Jan in areas with concentrations of prairie grouse or waterfowl. There were several reports in the winter of 1983-1984; falconers reported 12 in the Sandhills for the season (Williams 1984and it was reported from Lancaster Co 3-21 Jan (Green 1984; Cortelyou 1985a), Saunders Co 8 Jan (Green 1984), Polk Co 28 Nov (Cortelyou 1985b), and Douglas-Sarpy Cos 7 Jan-14 Feb (Green 1984). One was in Lancaster Co 24 Feb 1985 (Williams 1985). 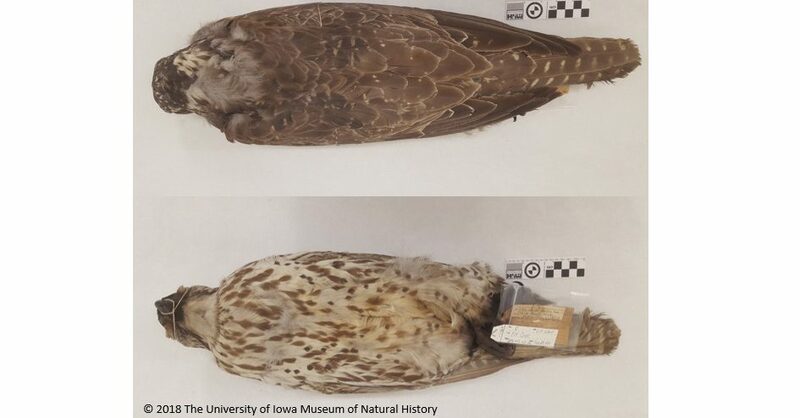 Photograph (top) of a Gyrfalcon specimen taken at Elm Creek, Buffalo Co 23 Feb 1885 provided by the University of Iowa Museum of Natural History. Booms, T.L., T.J. Cade, and N.J. Clum. 2008. Gyrfalcon (Falco rusticolus), version 2.0. In The Birds of North America (A. F. Poole and F. B. Gill, Editors). Cornell Lab of Ornithology, Ithaca, New York, USA. https://doi.org/10.2173/bna.114. Brogie, M.A., and D. Heidt. 2016. Gyrfalcon in Boyd County, Nebraska. NBR 84: 96-97. DuMont, P.A. 1933. A definite Nebraska record for the Black Gyrfalcon. NBR 1: 12. Green, R.C. 1984. Gyrfalcon. NBR 52: 23. Morris, L. 1993. Gyrfalcon. NBR 61: 136-137. Ohlander, B.G. 1979. Gyrfalcon; Prairie Falcon. NBR 47: 58-59.